Smooth skin is not just from good genes but also from good daily habits. According to T: The New York Times Style Magazine, there are 3 main steps for skin-care routine. It starts with cleansing, continues with toning to balance the skin, and moisturizing to hydrate and soften the skin. Thus, washing your face with face wash product – not just water – is one of the most important step for skin because it eliminates impurities that stay on the face, decreases oiliness and prevents acne. About 29,500 respondents in Brazil, Indonesia, Philippines and Singapore shared how they wash their face. Check out the highlights! At least 70% of respondents mentioned they use face wash product to wash their face. But in Singapore, almost all respondents or 92% use face wash in regular basis. Each country has their own favorite face wash type. 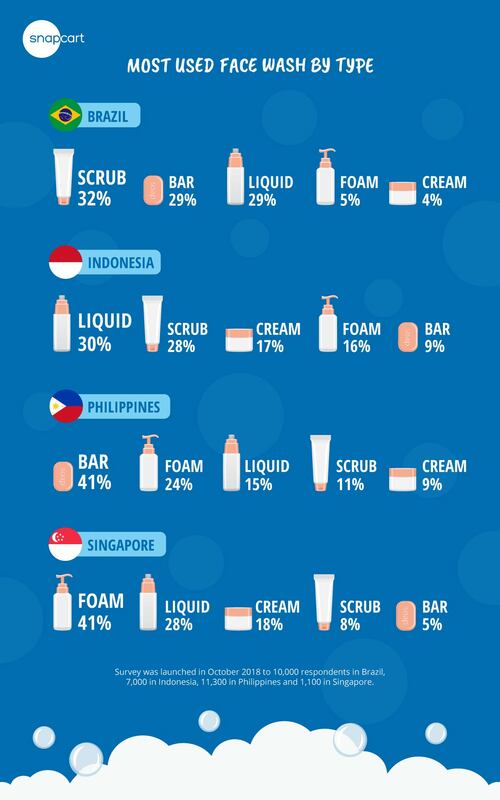 Brazilians prefer scrub soap and Indonesians prefer liquid. For Filipinos, they like bar soap, while for Singaporeans foam soap is their favorite. Consumers have varied options for their skin care routine. Prices, benefits, beautiful packaging, and pleasant aromas are considered as key factor in choosing a face wash brand. 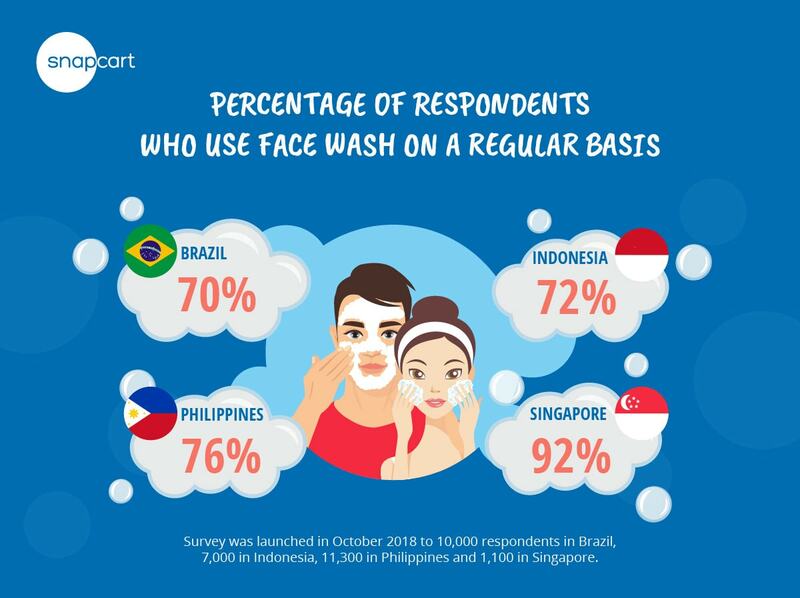 This survey revealed that “benefit” of the product is the main factor in choosing a face wash brand for Brazilians, Indonesians and Filipinos. 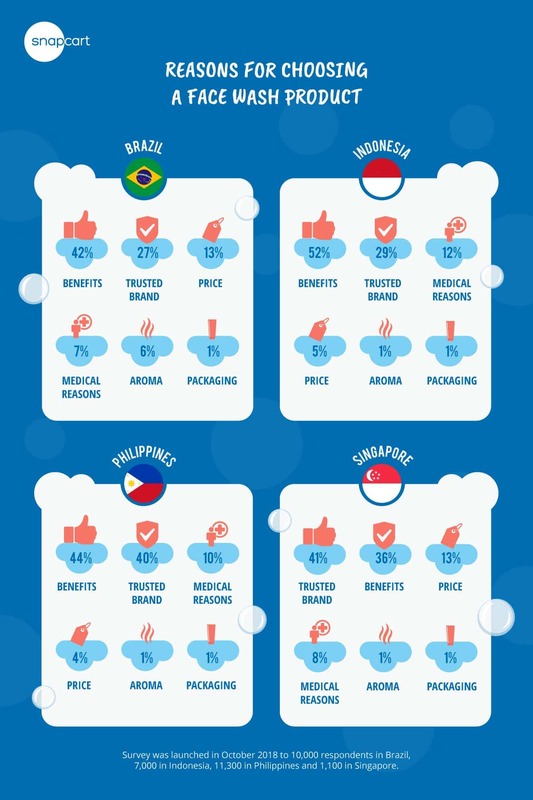 It’s interesting that female Filipinos prefer benefits, while men choose a product because it is a trusted brand. A bit different with Singaporeans, they choose a face wash product according to the trusted brand. Respondents from 4 surveyed countries agreed that nice packaging is the least important factor when choosing a face wash brand.